T here’s a huge Internet buzz today about a Google Android app called “Dog Wars,” where virtual dog fights using virtual Pit Bulls glorify illegal dog fighting. 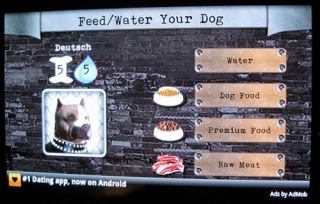 Using such phrases as “Raise your dog to beat the best,” “puts money in your pocket, and lets you earn more in fights,” provides “guns for police raids,” and even “inject your dog with steroids,” has instilled message boards to light up demanding that the game be taken off the market and the creators fired. So what does Kage Games, the creator of the free app, do in an attempt to keep their customers and smooth over the controversy? You’re right if you guessed that the game developer released a statement insisting they are indeed animal lovers and a percentage of their profits from this game will benefit animal rescue groups and tsunami relief. Seem a bit contrived? Giving back means giving back to customers, and the majority of people when making purchases are only too delighted to know that a percentage of their purchase could be going to benefit a charity, the environment, or even to a great disaster. Goodwill, however is not generated by an obvious public relations ploy. If a company makes a grave error, a charitable contribution can even make it worse. The prime intention of any organization to give back should go to what the customers want. A company builds their reputation by its day-to-day operations and consistently works on caring and honesty. Charitable contributions are a part of consistent goodwill, and whether the donations go to national charities or even community organizations, it should be the customer base that determines where the contribution is headed. Companies that make mistakes need to apologize and never make the same mistake again. Of course we all expect them to make retribution, but never say it is a charitable donation. That goodwill every business would like to have is a positive added bonus to the ethical and moral standards mankind depends on to make this a better world.